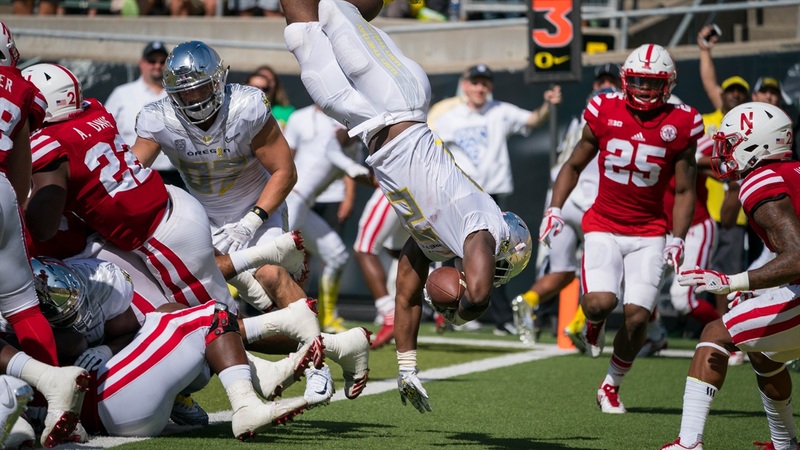 Nebraska started slow but tried to pull off a furious comeback attempt that fell just short in a 42-35 loss to Oregon on Saturday. Prior to the season opener, offensive line coach Mike Cavanaugh said Nebraska was going to need redshirt freshman right tackle Matt Farniok and that he had to be ready when his number was called. Farniok received that message again last week as senior starter David Knevel continued to deal with an ankle injury that still has him in a walking boot. That meant Farniok, who had played a total of three snaps off the bench in week one, was going to be making his first career start at Autzen Stadium in Eugene, Oregon. Farniok played every snap on offense and appeared to hold his own as well as anyone on the line. Farniok had wide eyes heading into the game, but once the game began he was right in his element. Once I hit the first play, I was like ‘OK, I’m just playing football; I’m playing football with really good guys.’ What more could I ask for? The freshman from Sioux Falls, South Dakota, said he was not phased by the noise from what Mike Riley called one of the loudest stadium’s he’s ever coached in. Farniok’s performance seemed to impress his teammates as well, especially his counterpart on the other side of the line who knows what it feels like to start as a redshirt freshman. A starter going down is never a good thing, but based on Farniok’s performance against the Ducks it seems like the Huskers have developed enough depth to survive for however long it takes Knevel to return to full strength. “When David comes back, that will actually be good for our team; we’ll be deeper with guys that have played in the games,” Coach Mike Riley said. Blame the tardiness of this post on me. Jacob got his takes in Saturday evening like an overachiever and I, per usual, am trash. As for my initial reaction from the Huskers’ 42-35 loss to Oregon? Man, what an atmosphere. Autzen Stadium was absolutely rocking prior to kickoff and it sounded like there was a lot more than the announced sellout-crowd of 58,389. Making things even more impressive was the showing of support from the Nebraska fans. The entire west end zone was Husker red and there were “Go Big Red” chants before kick that drowned out the Ducks’ cheers. For my first experience with a Nebraska road game, you guys did not disappoint. New defensive coordinator Bob Diaco seemed to think the same thing after the game. Wide receiver De’Mornay Pierson-El said they have the best fans in the country and he wasn’t surprised at all to see so much red. Linebacker Luke Gifford said the show of support was part of the reason the defense bucked up and played like its hair was on fire in the second half. About that second half though, we saw some interesting things. First and foremost, I firmly believe Gifford should be starting. It’s clear he’s a leader in that unit and one of the most talented players in a Nebraska jersey at any given point. Second, and this isn’t as positive, Nebraska, to me, doesn’t have the overall speed and coverage ability at linebacker they need to run this 3-4 defense successfully. The Oregon Ducks offense was just too fast. Having a slot receiver or a running back on a linebacker is already an advantage for the offense, but it’s proven to be a major pressure point so far this season in the Huskers' secondary. Johnny Johnson III, a freshman slot receiver for the Ducks, had 80 yards in the game. Brendan Schooler, Johnson’s backup, had 41. Chris Murray, Arkansas State’s starting slot man in week one, had 90 yards and a score on nine catches against the Huskers. No, not all of that yardage is coming against a Nebraska linebacker, but enough of it is to raise questions. The edge guys in Marcus Newby and Alex Davis got beat a lot Saturday and that’s not a good sign moving forward. It’s actually more interesting for me that we had an extra day to let this one marinate before giving thoughts. My reaction coming out of the game was that Nebraska was simply overmatched and not ready to start the game in Oregon. The crowd for Oregon did not seem like it bothered Nebraska coming out of the gates but the speed of Oregon did. It looked more like a traditional Pac-12-versus-Big Ten matchup speed-wise. Then you watch the tape back you can’t help but wonder just how close Nebraska is to being 2-0. Between the interceptions, the costly penalties or blown assignments there are plenty of ways you can look at this game as a missed opportunity for Nebraska. Of the things I mentioned that plagued Nebraska on Saturday, the blown assignments trouble me the most. The reason for that is, through two games of the season we aren’t much closer to any clarity on if Nebraska has the right 11 on defense or if more patience is needed to continue learning a new defense. For example, there was a play in the game where Charles Nelson, who is one of the fastest players in the nation, lined up in the slot and got behind Mo Barry for an easy completion after a good throw from Justin Herbert. Where does the blame go on that? First, you have to understand the coverage and Barry was not matched up man-on-man there but was supposed to be in a deep hook to take away the intermediate area of the field. So was Barry not decisive enough in getting to his spot? Not quick enough? Was he not aligned properly? Those types of breakdowns in coverage could be discussed on way too many passes through two games of the season. There has correctly been a lot of talk about passing yards allowed so far this season but for me, the biggest question is about the second level of the defense in coverage.